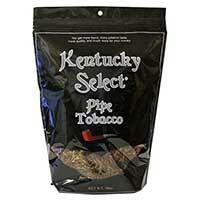 Made using all natural tobaccos, Kentucky Select Pipe Tobacco is an affordable option for those who go through tobacco like water! You’ll love the effort and quality that’s put into each of their unique flavors. 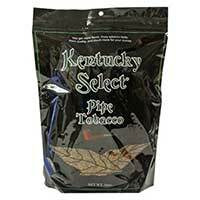 Each blend of Kentucky Select Pipe Tobacco is packed full of smooth and medium cut tobacco that features practically no shake or harsh after taste. 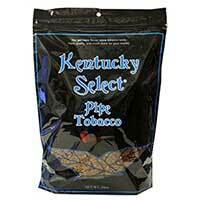 It’s really an amazing bargain buy for any smoker looking to save a few bucks and still enjoy a premium blend. You’ll be able to smoke Kentucky Select Pipe Tobacco all day and night if you want! It packs rich flavors that will definitely leave an impression on your taste buds, making them want more. 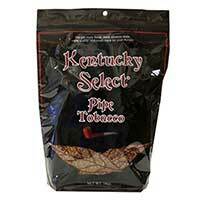 With so many flavor options, the hard part is trying to decide which one to smoke! Full Flavor Red is bold and flavorful. It’s their original blend so expect it to pack a punch. The Natural Gold is natural in composition and flavor, featuring a medium-bodied blend. The Menthol Blue is much smoother and features a delightful menthol flavor, while Menthol Green is bolder and stronger. Silver is easy and has a soft flavor with no after taste, while Turkish Black is exotic and bold in flavor.